The Lord Jesus has many wonderful names, and each name tells us something about Him, who He is and what He has done for us. 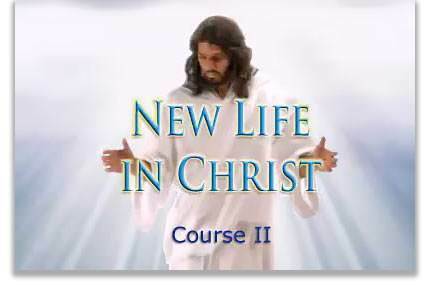 In this lesson we will be thinking about Jesus as "the Lamb of God." 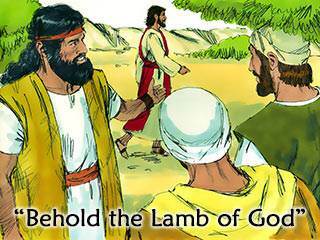 When John the Baptist first saw Jesus he said, "Behold the Lamb of God, which takes away the sin of the world." When we come to the last book of the Bible, we find that it is "the Lamb" who is upon the throne of God. But what does this name mean? A "type" is something which pictures or illustrates a spiritual truth. To understand why Jesus is called "the Lamb of God", we must go to the Old Testament. Throughout the Old Testament there are many "types" of salvation. A "type" is something which pictures or illustrates a spiritual truth. For example, when a person offered a lamb as a sacrifice for his sins, it was a type or picture to show that the Lord Jesus would one day die on the cross for our sins. In this lesson we are going to consider some of these types or pictures of our salvation and see what God has to teach us from them. We will see why Jesus is called "the Lamb of God." The Bible says that the first man, Adam, was created by God. God created a wife for Adam and her name was Eve. The Bible says that Adam and Eve were created "in the image of God." And here is something even more wonderful: they were created in such a way that God Himself could dwell in their hearts. 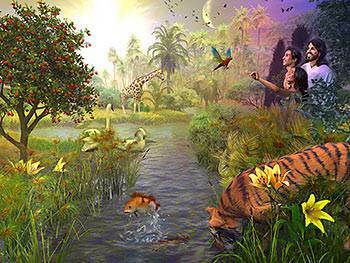 Each evening God came down and walked and talked with Adam and Eve. How happy they were! But, one day, someone else came into the garden. It was Satan. He was in the form of a serpent. Satan told Eve that, if she and her husband ate the forbidden fruit, they would not die as God had said, but they would be like gods. 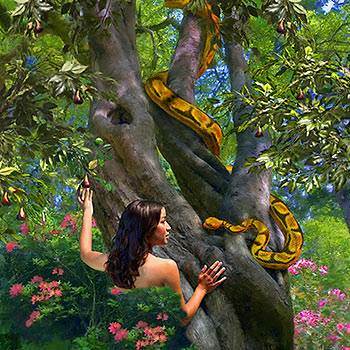 Eve believed Satan instead of believing God. She took the fruit and ate it. She gave the fruit to Adam and he ate it also. Adam and Eve sinned. They disobeyed God. God had said, "In the day that you eat thereof you shall surely die." Did Adam and Eve die physically that day? No, they did not. But they died spiritually. This means that they were separated from God. It was their sin that separated them from God. 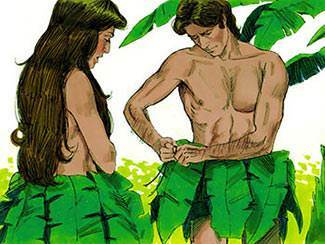 Before Adam and Eve sinned, they did not need clothing. They were clothed with God's "glory light." Now that they had sinned, this glory light was gone. When God came to walk with them that evening, Adam and Eve tried to hide from God. They were afraid of God because they knew they had sinned. God called them to Himself. The aprons of fig leaves which Adam and Eve had made for themselves were not acceptable to God. The Bible says that God clothed them with "coats of skins." Where did the coats of skins come from? They came from animals. 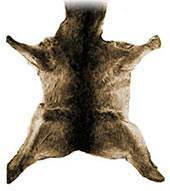 God killed innocent animals to provide the coats of skins for Adam and Eve. God taught Adam and Eve that something had to die for sin. The Bible says that "without the shedding of blood there is no forgiveness of sins" (Hebrew 9:22). This shows us how terrible sin is in God's sight. Remember: Without the shedding of blood there is no forgiveness of sins. This great truth is taught throughout the entire Bible. Another "picture" or type of salvation is given in the story of Cain and Abel. Cain and Abel were the sons of Adam and Eve. Cain was a farmer; he grew things to eat. Abel took care of the sheep. These two sons had been taught the true way to worship God. They knew that they must offer a lamb as a sacrifice for their sins. When it was time to bring their offerings to the Lord, Abel brought a lamb and offered it as a sacrifice for his sins. But Cain did not bring a lamb; instead, he brought some of the beautiful fruits that he had been growing. 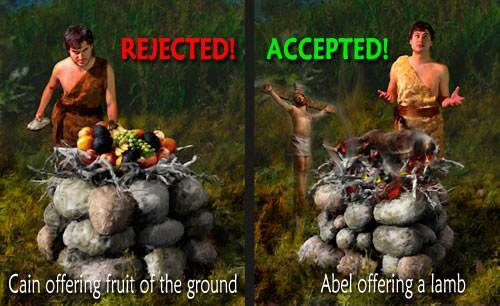 The Bible says that God accepted Abel's offering, but He rejected Cain's offering. It is important for us to know why God was pleased with one offering and displeased with the other. 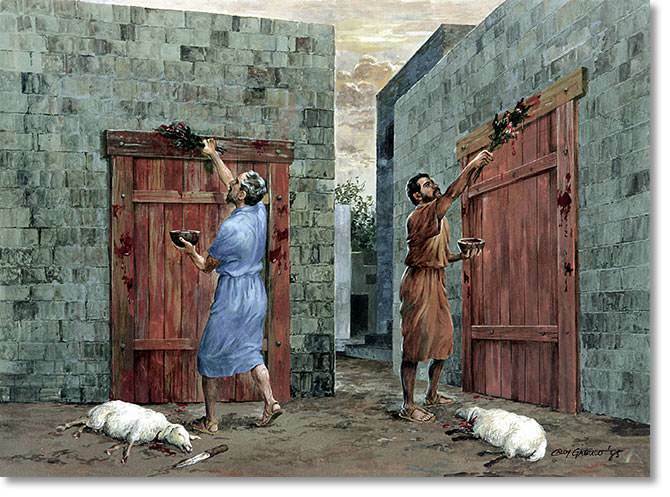 God accepted Abel's offering because Abel obeyed Him and offered a lamb which is a type or picture of the Lord Jesus dying for our sins. God rejected Cain's offering because Cain did not obey Him. Instead of offering a lamb as a sacrifice for his sins, Cain did what he thought was right. But God did not accept his offering. We come now to another wonderful type of our salvation: the Passover. God's people, the Jews, were in Egypt. They were slaves of Pharaoh, the king of Egypt. Pharaoh was very cruel to them, so the children of Israel cried to the Lord. God heard their cry and sent Moses to lead them out of the land of Egypt. God told Moses to go to Pharaoh and say, "Thus says the Lord God of Israel, Let My people go…" But Pharaoh would not let the children of Israel go. He said, "Who is the Lord that I should obey His voice?" God gave Moses power to bring nine great plagues, or judgments, on the land of Egypt. Each time there was a plague on the land, Pharaoh would promise to let the children of Israel go. But when Moses removed the plague, Pharaoh would change his mind and refuse to let them go. Then one day God told Moses that He was going to send one final plague on the land. He would send His death angel over the land, and the oldest son in every house would die. God said, "Pharaoh will surely let you go after this." It happened just as God had said. The death angel passed through the land and in every house that did not have the blood on the doorposts, the oldest son died. In every house that had the blood on the doorposts, the oldest son lived. He was safe! It was the blood of the lamb that protected him from God's judgment. When we take Christ as our Savior, we are protected by His blood. When God looks into our heart and sees that we are trusting in Christ's blood, He says, "I will pass over you. My judgment will not fall on you." After the children of Israel left Egypt, they crossed over the Red Sea. At Mount Sinai, God gave them the Ten Commandments. These commandments told them what was right and what was wrong in God's sight. Because they had sinful hearts, the children of Israel did not keep God's holy laws. This meant that they were sinners and under the penalty of death. But God made provision for them so they could be forgiven of their sins. 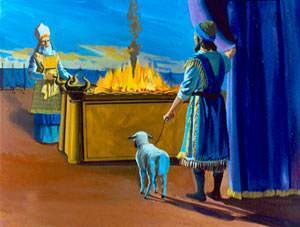 The person who wanted to be forgiven could bring a lamb to the tabernacle as a sacrifice for his sins. He laid his hands upon the lamb and said something like this, "I have sinned, but God has allowed this lamb to die in my place." 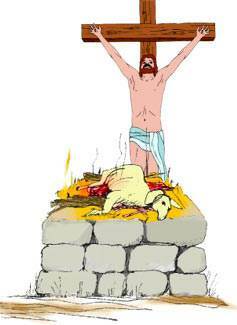 That lamb died for the sins of that person. For thousands of years, men sacrificed animals as God had told them to do. The blood of these animals did not take away their sins; these sacrifices were simply types or pictures of Christ's death for us. Their many sacrifices pointed forward to the one sacrifice of Christ on the cross. Old Testament believers were saved by Christ's death on the cross just as we are, but there is one difference. They were saved by looking forward in faith to Christ's death, and we are saved by looking back in faith to His death on the cross. In this lesson we have learned a great truth: Without the shedding of blood there is no forgiveness of sins. Perhaps by now you are wondering, "Why don't we offer a lamb as a sacrifice for our sins?" The reason we do not offer a lamb as a sacrifice is because Jesus is the Lamb of God and He died for our sins. Jesus is the real Lamb, the fulfillment of the types in the Old Testament. When John the Baptist saw Jesus, he said. What does this name "The Lamb of God" mean? It means that Jesus Christ is the perfect and complete sacrifice for our sins. There is no need for us to offer a sacrifice because Jesus died for our sins. The Lord Jesus was crucified about nine o'clock in the morning. He died about three o'clock in the afternoon. Before Jesus died, He cried out, "It is finished!" The Bible says that we are "justified" by Christ's blood, that is, by His death on the cross for us. What does it mean to be "justified"? It means to be declared righteous in God's sight. 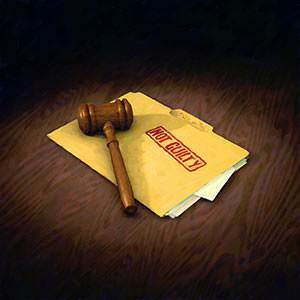 It means to be declared "Not guilty!" by God Himself. Our enemy, Satan, likes to remind us of our sins and failures. He likes to condemn us and make us feel guilty. 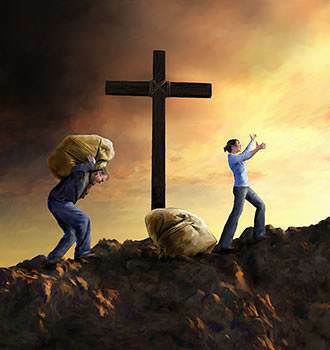 On the cross, the Lord Jesus paid for all our sins, even the ones we commit after we are saved. When Satan condemns us by pointing to our sins, we can answer him by pointing to the blood of Christ. We can say, "Yes, I have sinned, but the blood of Jesus Christ, God's Son, cleanses me from all sin."